I wish I could go there! =( Looking forward to hearing more about it and seeing more drawings, don't keep us waiting too long, lol. oh, sounds fabulous...I would have loved to have been there. 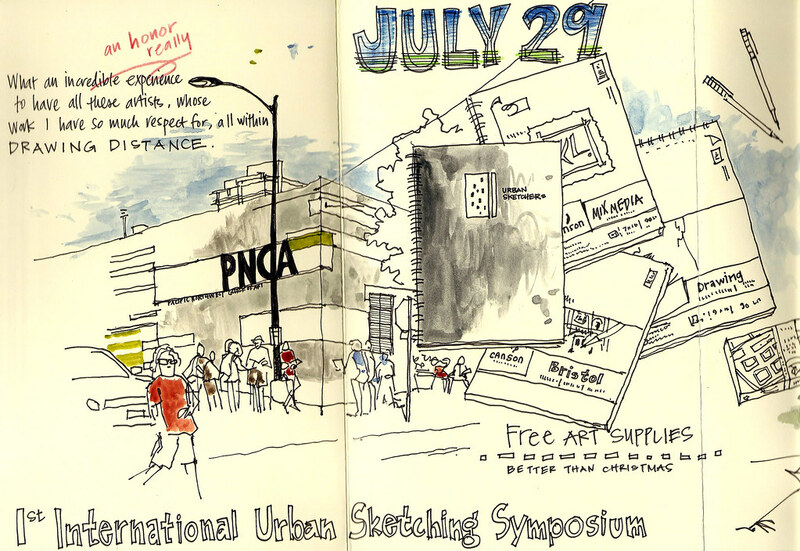 I go to school at PNCA! I was super bummed that I missed out on this event! I'll look forward to reading all about it! Damn. Just found out about the whole shebang from a friend who attended. I wish I had known it was happening as I would have loved to have been there. Ah well, maybe Lisbon? Suzanne, I'm sorry I didn't get to really meet you at the symposium but I loved the continuous spread you did in the Moleskine. Hope to see you in Lisbon next year. Hi Suzanne, your sketchbook is so good. We should have had name tags at the start, I didn't realize you were there until the final night and I looked inside the front cover of your sketchbook. When you said hi I was tired and grumpy, sorry, should have talked to you more, next time I hope. Looking forward to your posting your drawings.